As I was uploading my iPhone photos and saving them to my computer, I noticed that I have been a part of the do.Good.Stitches bee since September of 2011. I don't even know how many blocks I have made over these last three years as sometimes the requirements are one block, sometimes two blocks and sometimes our group has taken a month off during the Summer or Winter. Yet all in all, it's over twenty quilts that I have been blessed to be a part of. 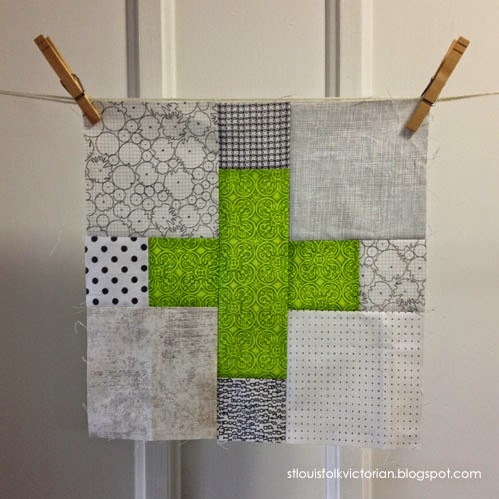 This month is my month to organize the bee and I have asked the group to make two low-volume/green Plus Blocks. 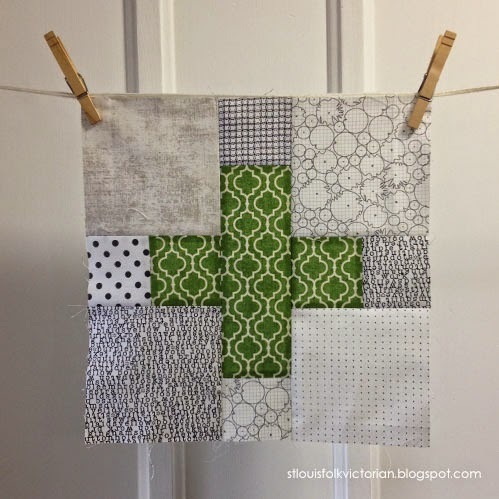 The Plus Block tutorial/diagram I have chosen comes from my quilty friend, Adrianne from On The Windy Side. These blocks came together very quickly and will make an interesting scrappy quilt later this Fall. If you would like to know more about do.Good.Stitches, and how you can be a part of this modern charitable bee check out Rachel's blog Stitched In Color.